Dedicated to the preservation of cemetery tombs, monuments, and landscapes. Oak and Laurel Cemetery Preservation, LLC, is a New Orleans-based cemetery preservation company owned and operated by Emily A. Ford, MSHP. Ms. Ford has been active in cemetery preservation since 2009, focusing specifically on the unique cemeteries of southern Louisiana. We are dedicated to the stewardship of the historic tombs, copings, monuments, and landscapes of historic cemeteries, including tomb restoration. We enable tomb owners and cemetery friends to participate in the responsible preservation of their community resting places. Experience has taught us that cemetery preservation is not only about brick-and-mortar repairs; it is also about community participation, regular care, and preventive maintenance. We approach all projects, be they tomb restorations, interment research, or any other project, with a commitment to craft and excellence. Through restoration, documentation, and education, we seek to create sustainable solutions for long-term preservation and relevance of historic cemeteries. We approach each project with the next century of the cemetery in mind, adhering to the Secretary of the Interior’s Standards and Guidelines for Historic Preservation. Contact us today to discuss your preservation project. 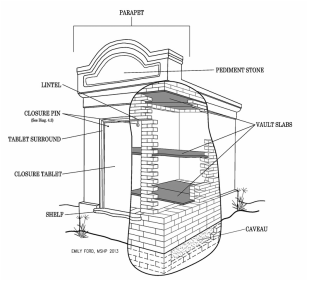 Our name derives from extensive research into the original tomb builders and stonecutters of New Orleans’ irreplaceable cemetery architecture. The oak and laurel wreath was a common motif prominent among mid-nineteenth century German-born and German-extracted stonecutters, namely Anthony Barret and H. Lowenstein. The laurel bow is a symbol of victory, glory, and immortality. The oak branch represents eternity, honor, and faith. The use of this symbol as our namesake is meant to pay respect to the original craftsmen who created the tombs we preserve. Our logo is based on one such wreath carved by H. Lowenstein in the 1850s. From tomb restoration to consultation, genealogical research, and advisory services, we strive to preserve cemetery resources of all types. 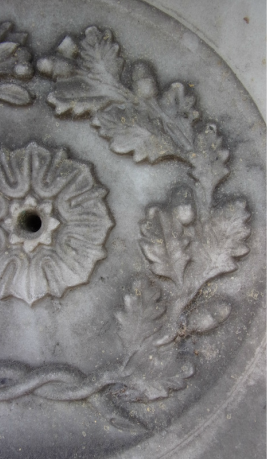 Preservation in action: Follow the link above to see examples of Oak and Laurel Cemetery Preservation, LLC's tomb restorations, monument repairs, presentations, and other projects.